Now, onto the Brooder. I have rapidly growing chicks – multiplying their size at an alarming rate! Which means that their meager cardboard box brooder I had for them when I brought them home is no longer sufficient. Time for an upgrade. I was thinking and googling and trying to come up with something cost effective and easy – and I am happy to say that I did, and with items ONLY purchased from the dollar store at that! (Except the heat lamp, feeder and waterer which I had purchased earlier from the Feed Store). 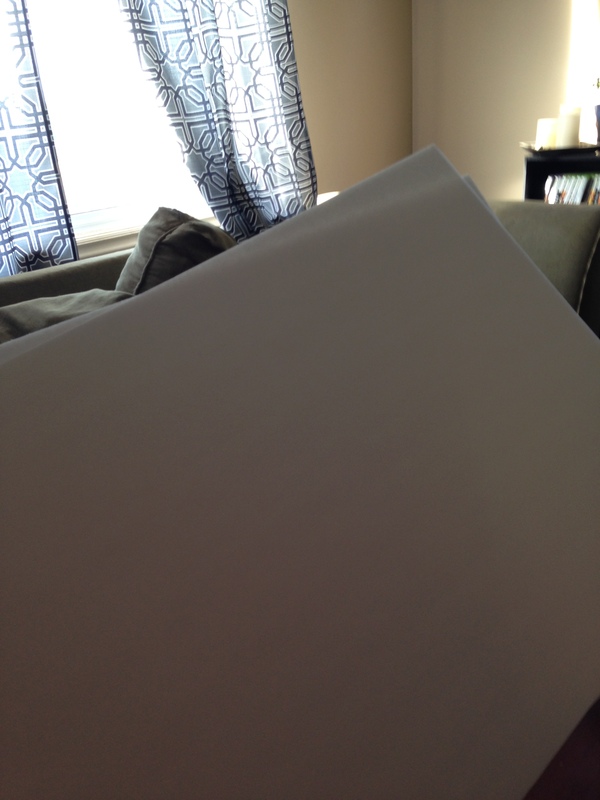 This is the foam board I got for 1 each – I bought six, but I only needed four (two were back ups JUST IN CASE). 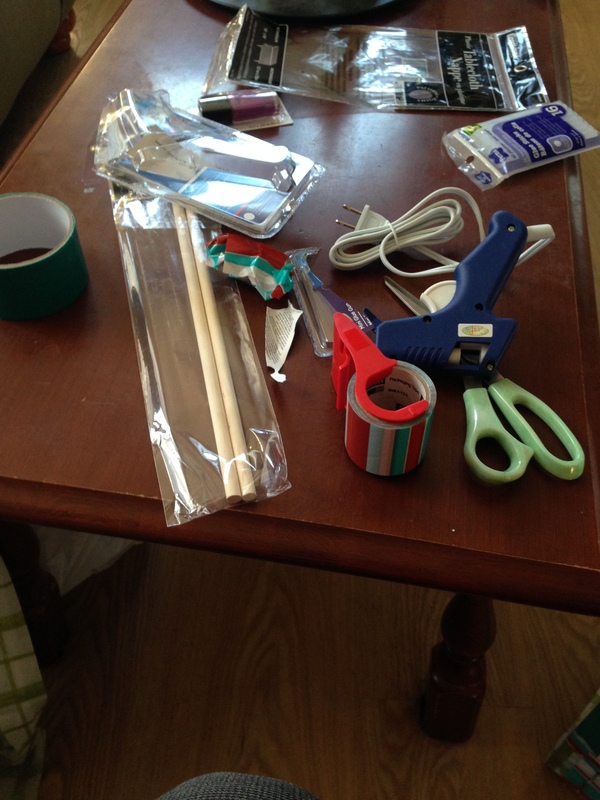 I forgot to take a picture of my supplies before, but this is after…there is also four rolls of vinyl and six foam boards – you get the gist. I used the four foam boards, and stuck vinyl ($1 ea) to 3/4’s of the inside and about 1/4 of the underneath/outside to make sure the section exposed to chick “splatter” is well protected. Then I took duct tape and connect each board in the corners (making sure the vinyl portion is the bottom). I picked coloured duct tape because I’m like that, but I suppose you could just use regular silver duct tape. I popped holes in the corners and ran small wooden dowels through ($1 for 6) – I did this for all four corners, which adds stability as well as roosting perches for when the chicks are old enough to try. I used a glue gun on the OUTSIDE of the brooder to seal the wooden dowels in the holes – I didn’t want to chance them slipping and one of the babies getting hurt. I wouldn’t recommend using it on the inside because they could peck at it and ingest it. 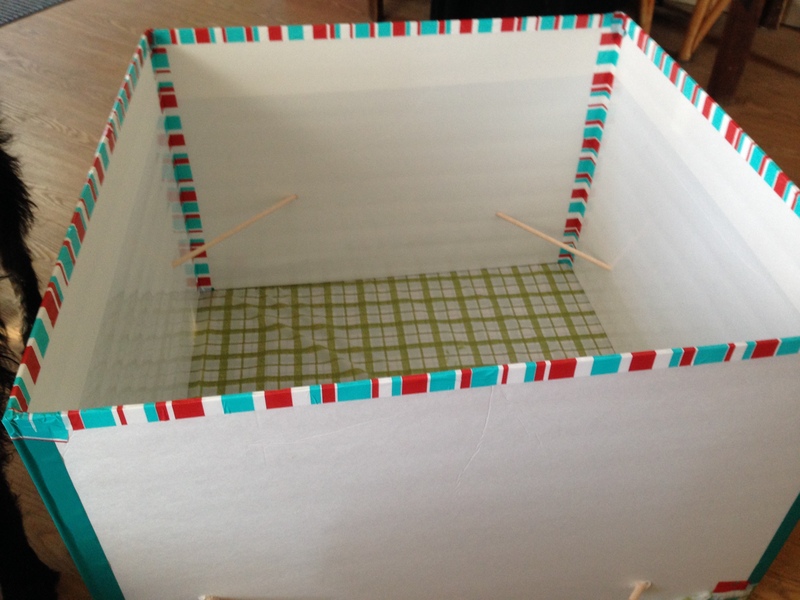 I taped a tablecloth ($1) to the bottom to provide a water resistant barrier between the brooder and the floor. I had hoped to wrap it like a present, but it didn’t work like that so it’s not that pretty on the outside – but it’s the inside that counts anyway. I added a final layer of tape to the top so that I could provide additional protection against the heat lamp – although it is strung up with three different ropes in three different places to prevent falling. 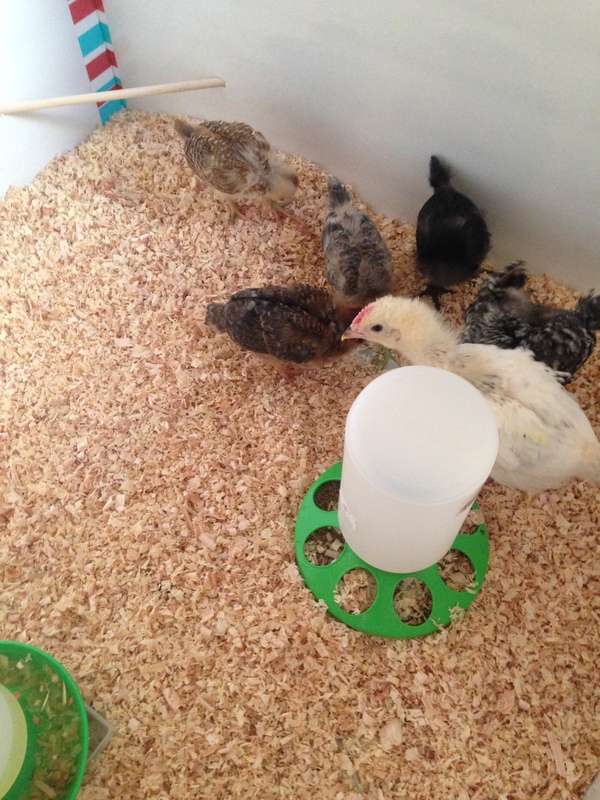 Then I added the shavings, feeder/waterer and – of course – the babies! They love their new space! They ran around trying to fly (hehe) for like 20 minutes until they all passed out contentedly – running and flapping is hard work, ya’ll! Happy babies! See all the sawdust in their feeder? That’s evidence of playful chicks! Although it is A LOT of work for me because I am constantly emptying food/water because it’s full of sawdust. LOL. 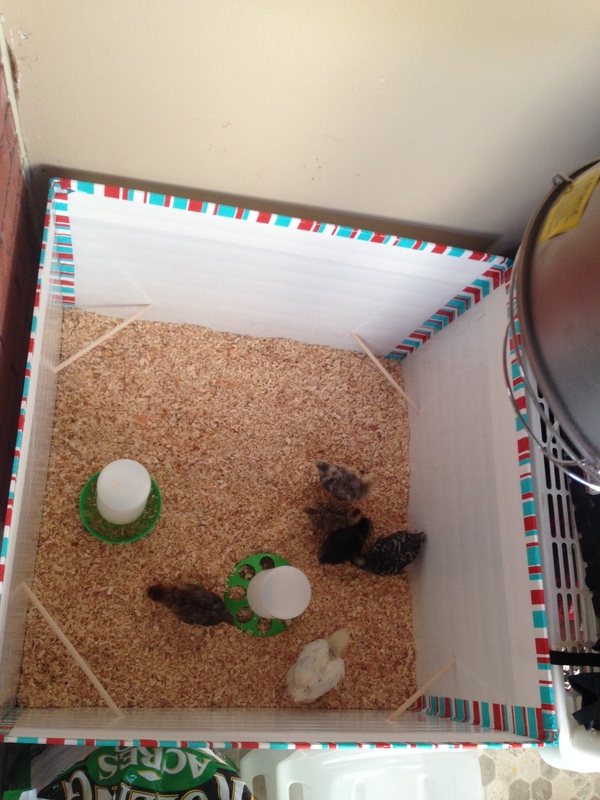 This brooder cost me a total of $24 at the dollar store – and it will be easy to extend and add additional portions as they grow! It’s also tall enough that they can’t hop/fly out so I don’t have to put a lid on it – which is nice to allow air flow. 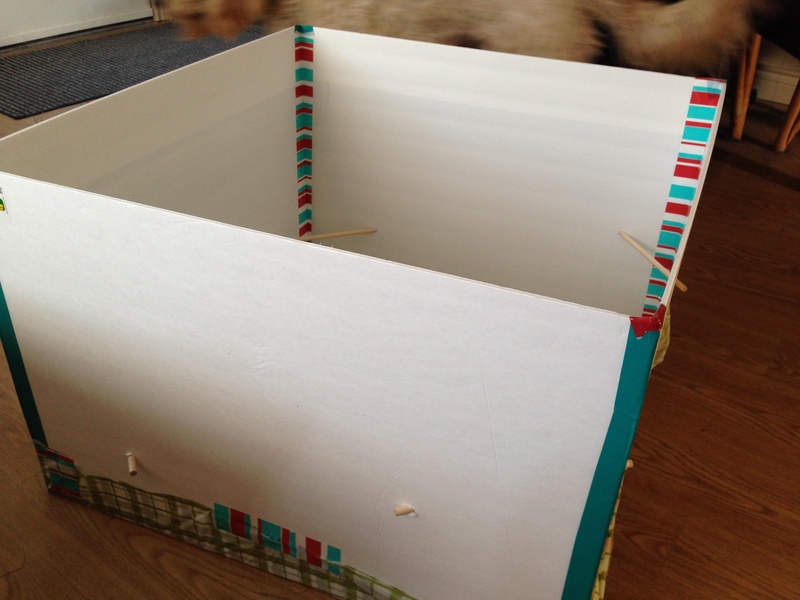 Because of the vinyl, it won’t get soggy like my cardboard boxes did and it’s way cheaper than Rubbermaid bins! I love home project like this – it’s fun to plan and execute them and it’s always nice to see their happiness as a result. I just hope this one lasts longer than a week like the last one did! LOL. Great job! I love when I can make something instead of buying. It’s such a sense of accomplishment.